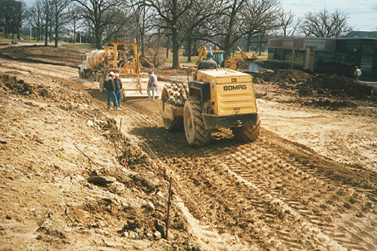 Soil stabilization is the alteration of soil properties to improve the engineering performance of soils. The properties most often altered are density, water content, plasticity and strength. 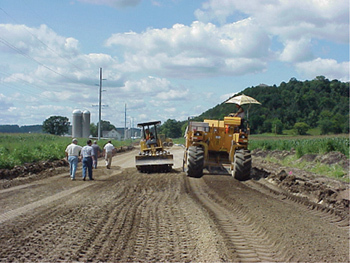 Modification of soil properties is the temporary enhancement of subgrade stability to expedite construction. It should be noted that the results obtained from ASTM D 5239 only characterizes the cementitious characteristics of the fly ash-water blends and does not alone provide a basis to evaluate the potential interactions between the fly ash and soil or aggregate. The use of fly ash in soil stabilization and soil modification may be subject to local environmental requirements pertaining to leaching and potential interaction with ground water and adjacent water courses. Delay time. Delay time is the elapsed time measured between when the fly ash first comes into contact with water and final compaction of the soil, fly ash and water mixture. Compressive strength is highly dependent upon delay time. Both densities and strength are reduced with increasing delay to final compaction. Delay time is critical due to the rapid nature of the tricalcium aluminate (C3A) reaction that occurs when Class C fly ash is mixed with water. Densities and strengths are reduced because a portion of the compactive energy must be used to overcome the bonding of the soil particle by cementation and because a portion of the cementation potential is lost. Maximum strength in soil-fly ash mixtures is attained at no delay. 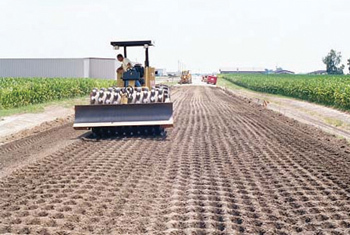 Typically, a one-hour compaction delay is specified for construction purposes. Moisture content. The water content of the fly ash stabilized soil mixture affects the strength. The maximum strength realized in soil-fly ash mixtures generally occurs at moisture contents below optimum moisture content for density. For silt and clay soils the optimum moisture content for strength is generally four to eight percent below optimum for maximum density. For granular soils the optimum moisture content for maximum strength is generally one to three percent below optimum moisture for density. Therefore, it is crucial that moisture content be controlled during construction. Moisture content is usually measured using a nuclear density measurement device. Figure 7-2: Compaction of fly ash stabilized soil. Addition Ratios. Typical fly ash addition rates are 8 percent to 16 percent based on dry weight of soil. The addition rate depends on the nature of the soil, the characteristics of the fly ash and the strength desired. The addition rate must be determined by laboratory mix design testing. In general the higher the addition rate the higher the realized compressive strength. Fly ashes for state department of transportation projects are usually specified to meet AASHTO M 295 (ASTM C 618), even though the requirements of this specification are not necessary for this application and may increase the ash supply costs. Increasingly non-AASHTO M 295 compliant materials are being successfully used. It should be noted that virtually any fly ash that has at least some self-cementitious properties can be engineered to perform in transportation projects. Soil Properties. The plasticity of soils treated with Class C or other high-calcium fly ash is influenced by the types of clay minerals present in the soil and their adsorbed water. Soils containing more than 10 percent sulfates have been prone to swell excessively in some applications. Also, organic soils are difficult to stabilize using fly ash. Many clay soils (plastic soils) undergo extensive volumetric changes when subjected to fluctuating moisture contents. These volumetric changes if not controlled can lead to movements in structures and impose loads which can cause premature failure. The plasticity of soils has historically been quantified by the plasticity index, as determined by ASTM D 4318. Typically specifications limit the plasticity index of a soil to no more than 10-12 to ensure a stable material. In general terms, the higher the plasticity index, the higher the potential to shrink or swell as the soil undergoes moisture content fluctuations. Figure 7-3: Mixing and compaction of fly ash into a plastic soil. Historically, plastic soils have been treated with quick lime (CaO) or hydrated lime [Ca (OH)2] to lower their plasticity. The lime chemically reacts with the soil particles, effectively changing the soil grains from clay size (less than 0.002 mm) to silt size (0.05 to 0.002 mm). The determination of the plasticity index is geared towards measuring this chemical change in the soil. Fly ash reduces the potential of a plastic soil to undergo volumetric expansion by a physical cementing mechanism, which cannot be evaluated by the plasticity index. Fly ash controls shrink-swell by cementing the soil grains together much like a portland cement bonds aggregates together to make concrete. By bonding the soil grains together, soil particle movements are restricted. Typical addition rates based on dry weight of soil are 12 to 15 percent. It should be noted that a Class C fly ash may contain 15 percent or more calcium expressed as calcium oxide, but very little of this calcium is in the form of free calcium oxide (CaO). Therefore, the determination of the plasticity limits is inappropriate when evaluating the effect of fly ash on the shrink-swell characteristics of a soil. To properly evaluate a fly ash for shrink-swell control, the soil-fly ash blends should be tested with a soil expansion test such as ASTM D 4829 or ASTM D 1883. The swell potential of fly ash treated soils is typically less than 0.5 percent under confining pressures of 48 kPa (100 psf) even when compacted two to four percent below optimum moisture content for maximum density. Soils must be compacted to their maximum practical density to provide a firm base for overlying structures. For soils to be compacted the moisture content must be controlled because of the relationship between soil density and moisture content. If the soil to be compacted is either to wet or too dry, the moisture content must be adjusted to near optimum to achieve maximum density. If a soil is too dry, moisture is simply added. If a soil is too wet, the moisture content of the soil must be lowered. Class C fly ash and other high lime fly ash have been found to be very effective drying agents, capable of reducing soil moisture content by 30 percent or more. The fly ash dries the soil by two basic mechanisms, chemical reactions that consume moisture in the soil and by simple dilution. Class C fly ashes contain tricalcium aluminate (C3A), which is highly reactive with water. C3A is the chemical compound present in ordinary portland cement which is responsible for early strength. The C3A present in fly ash reacts with the water, lowering the overall moisture content of the soil. The drying effect of fly ash in wet soil is very rapid and immediate, permitting the contractor to quickly proceed with construction. In addition to the speeding up of the construction process the use of fly ash provides several other benefits, such as making the soil more resistant to additional water infiltration, provides additional support for traffic, creates a more stable work platform and reduces dusting from construction traffic. Some state or local environmental agencies may require a leaching test of the ash prior to use.